The EUP8020X series are highly integrated single cell Li-Ion/Polymer battery charger IC designed for handheld devices. The EUP8020X accepts two power inputs, normally one from a USB port and another one from AC-adaptor. The EUP8020X automatically s the USB-Port or the AC-adapter as the power source for the system. 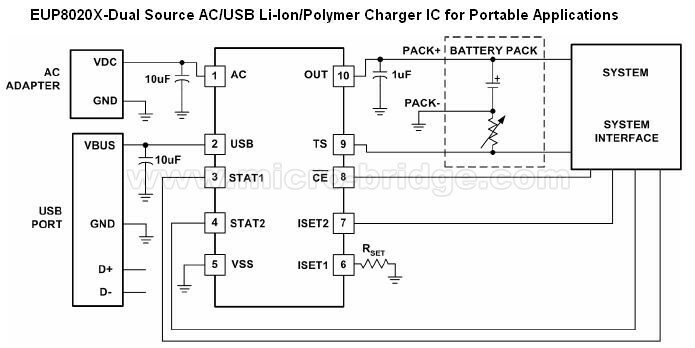 In the USB configuration, the host can from the two preset charge rates of 100 mA and 500 mA. In the AC-adapter configuration an external resistor sets the magnitude of the charge current, which may be programmed up to 1A. The EUP8020X charges the battery in three phases: conditioning, constant current, and constant voltage. Charge is terminated based on minimum current. An internal charge timer provides a backup safety for charge termination. The EUP8020X automatically re-starts the charge if the battery voltage falls below an internal threshold. The EUP8020X also automatically enters sleep mode when both supplies are removed. No external sense resistor or blocking diode is required for charging. The EUP8020X integrates internal power FET, current sensor, charge status and reverse current protection in a single monolithic devices.